Product Description: From 1904 to the present, The Buick: A Complete History is the authoritative, intimately fascinating story superbly told by two of the most respected automotive historians, each having devoted more than a decade to researching, interviewing, documenting and recording one of the great sagas of our time. Here is a book that has become the most treasured and inexhaustible reference work on this great marque. And now, to commemorate Buick's centennial, the new sixth edition expands to include information through model year 2004. Eight sections of Appendices include chapters on Buick racing cars; the Buick in Hollywood; the custom-bodied Buick; the Royal Buicks; heraldry and mascots of the marque; Buick around the world, with new information on ventures into China. 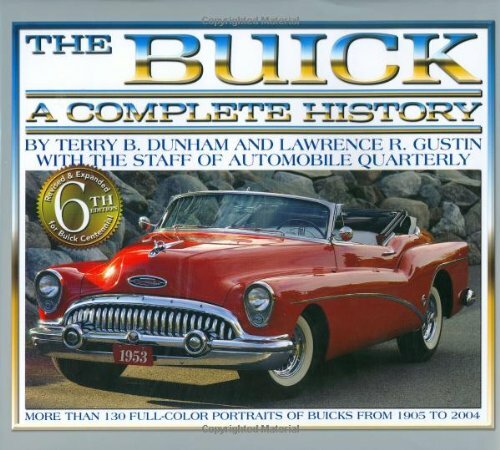 There can be no finer Buick book for the office, the showroom, or home library. For the Buick builder, the enthusiast, the collector, the dealer, the owner, it will be the bible on Buick.